Mike G and I decided to race Bonk Hard's Castlewood 8-hr AR as a 2-person coed team when our regular navigator, Bill L, put himself on the DL list with a foot injury. Neither Mike nor I had navigated an AR before, but with a few orienteering meets under our belts, and a daytime race, we figured we couldn’t get ourselves into too much trouble. The weekend prior to the race we participated as a team in SLOC’s Turkey-O race, a 3hr score-o format. There, we learned a few valuable lessons about team running when I decided to wander off and Mike thought I had fell into a pit, cracked my head open, and died. Sorry! Anyway, with our egos firmly in check, we arrived at racer check-in at Alpine Shop on Friday night, collected maps, agonized on how to spend the 30% off coupon (final answer: these poles), and chatted with other racers. After all this, we made the short trip over to Bill’s house to work on the maps for tomorrow’s race. Even if our navigator wouldn’t be able to race with us, we still wanted his input and advice. Bill graciously offered up his ping pong table for plotting and highlighting, and made copies and printouts of anything we asked! Thanks Bill! We received locations for the first 22 checkpoints, which would take us in a large loop starting & finishing at the Wyman Center, where we guessed that we would receive an unknown additional amount of checkpoints to complete the race. Maps organized, routes highlighted, and about 9pm we were able to depart to our respective abodes for final packing and some sleep. Once I was at home, I decided to make my own map of the bike course since I wanted to avoid shuffling the 4 maps we were given. I'm in the green sleeves. You can't see Mike but he's just behind me. Photo by Fredrik G.
We’re off! 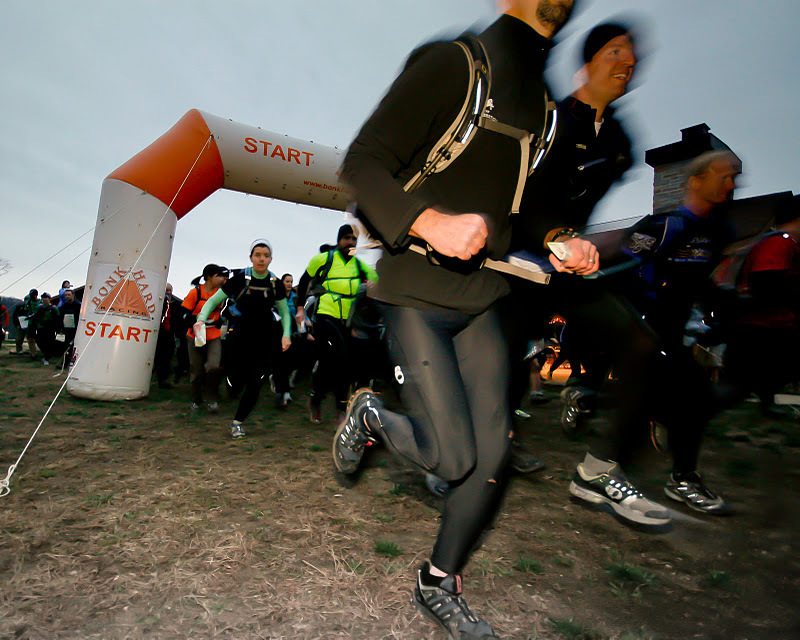 I squeeze through the inflatable arch start line and we immediately climb a sizeable ridge to start our race. We have decided on attacking these points as 2-1-3-4, but really any route choice mandates that teams haul themselves over this big hill so we have lots of company. And it just...keeps...going...up. I hang onto Mike’s pack for 10m stretches at a time to force myself to keep his pace. Finally we hit the road and are able to descend into a reentrant to punch CP2. We continue descending onto a limestone doubletrack path which allows us to fly until we have to climb again to CP1. From there we turn left up the ridge and use the paved road to hustle to the woods around CP3, which requires a furious descent and almost immediate ascent up a reentrant whose contours are much steeper than indicated on the map. Hard work! We arrive in third or fourth place, with enough time to catch a brief glimpse of Alpine Shop departing and hear Bushwhacker coming in behind us. Mike and I change shoes, arrange maps, don helmets, and hightail it out of the TA onto the gravel path we scouted this morning. We are nearly 50m down the path when we simultaneously hear shouts and I remember that we didn’t punch CP4. Mike rushes back to get the punch from the volunteers and then we skedaddle. Our instructions now are to take these points in order so we drop onto a wide limestone path back into the a valley to grab CP5. The descent highlights my second biggest weakness on the day...switchbacks! Even these wide ones are causing me to hit the brakes and it’s abundantly clear I haven’t had to turn at speed tighter than 90 degrees for a long time. CP 6 is low, also along the easy terrain and as we punch we look UP at a faint singeltrack path (the Green Rock Trail on the GORC map in the picture) we need to take to get to CP7. We are off the bikes almost immediately and the slow pushing pace has be questioning the maps...are we on the right trail? I have a few moments of intense fear that we are off-track but we keep pushing and the road comes into view exactly how I had pictured it so fears are abated for the time being. Now we are on singletrack that is actually rideable for most competent mountain bikers, a group of which I am not a member. Mike and I unknowingly rode this section of trail a few weeks ago in preparation for the race and even the pre-ride does little to help my flow. I just can’t get in a rhythm with the technical stuff so am off the bike more than I’d like. But, in true AR style, even when not riding I am pushing and hustling and flying-mounting to keep our team moving forward. Photo by Fredrik G's unmanned GoPro camera! We planned to go 39-38-40-41-42. We went 39-28-42-41-40. Probably the best route is 42-31-40-38-39. ..or not! As we arrive at CP15, there is a table with volunteers set up before we can even see the canoes. We are informed that the next leg is a surprise, optional, 5-point Bike-O. 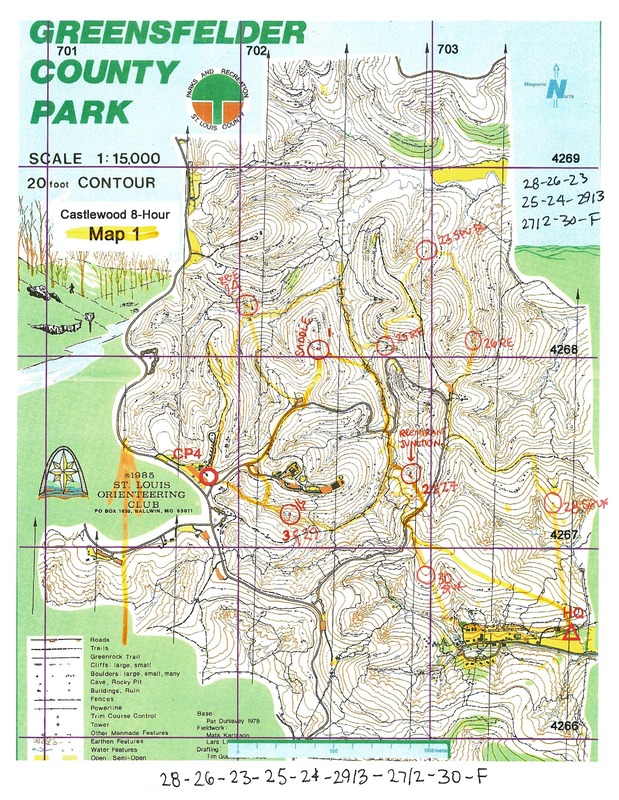 The official directions are to copy the 5 points onto a supplemental map we were given, but since Bushwhacker is right on our tails and my official race maps are buried in my map case, I flip over the surprise clue sheet and quickly transfer the points. We decide to go counter-clockwise and hustle out of the fake TA. The first two points (39 and 38) are easy and we pass Alpine Shop going in the opposite direction, to much cheering. The next point (CP41) marks the biggest mistake of the race for us - in my rush to “plot”, I neglected to note that CP41 = CP14 so we spend a few moments frantically searching to no avail, and decide to abandon the CP and keep moving. Midway to 42, I start re-reading the clue sheet to see where we screwed up. When I read “CP41 is same as CP14” I slam on the brakes and almost make Mike crash. Since we are closer to 42, we quickly punch that then retrace our tracks to the underpass to get CP41, then quickly grab CP40 on our way back to the fake TA. An inefficient route for sure, but it looks like it we are still among the top teams. As we pass CP15 for the second time, we are rewarded with a punch and a wave from Bonk Hard volunteer Pilar. It looks like she has her hands full with mid-pack teams arriving and we are glad for the space in the front of the pack. We ride our bikes as far as possible to the water’s edge, then ditch our packs and race back uphill to grab a canoe, PFDs, and paddles. Our bike transport system requires front wheels to be removed and we ratchet the frames upright into the boat. This goes pretty quickly for not having practiced and soon we shove out onto the water, with Bushwhacker 3-5 minutes in front of us. A good view of our bikes in the boat (even though this is at the end of the paddle). Photo by Fredrik G.
Less than a kilometer into the paddle and I have my first on-water navigational panic. I’m still working on my hand-drawn map and all I can remember about CP16 is it’s on the left-hand side of the river, at the first in a pair of bridges. Well, we paddle under I-44 and under an abandoned railroad trestle and no CP. We can see Bushwhacker ahead, who doesn’t appear to have punched either, so Mike offers to paddle while I dig out the real map and check. The real map calms me down as it shows we have about 2km to paddle before another bridge pair, where the CP is actually located. RELIEF! Gary, Bonk Hard’s new owner, has hung the punch actually IN the river (on an old piece of rebar shoved into the sand) which makes punching easier than it’s ever been from a boat. We keep paddling until the river starts making a right-hand turn and I have another panic..CP17 is supposed to be BEFORE the bend! Ah! Again, we watch Bushwhacker ahead and they don’t appear to be approaching the bank. Mike paddles solo again as I fish out the map (now at least closer to the top of my map case) and try to figure out what’s going on. I can’t. I hand the map over to Mike to read. He looks at it for all of two seconds and says “we’re not there yet, it’s before the SECOND right-hand bend.” Oh. Right. Roger that. We keep paddling. After punching CP17, are are close to Bushwhacker and pass them on a slightly risky line through the deadfall. About this time I realize I need to pee. Bad. REAL BAD. At first Mike tries to convince me to just pee in the boat. Not funny. Then he starts talking about deserts. Also not funny. I clamp down mentally and physically to paddle as fast as I can to the take-out, which is only about 3km away. I am tempted several times to beach the canoe, but each time we seem to get closer to the take-out and I just grit my teeth and hold it. Finally, Sherman Beach appears and I know I can make it. We beach, I sprint behind a pile of driftwood, and by the time I return back to the canoe Mike has unstrapped the bikes and removed his frame. In addition to re-assembling bikes, we have a gear check so this TA takes more time than usual. To complicate matters, the beach is full of sticky mud so our bike shoes and tires are coated with the heavy stuff, making clipping in difficult at first. We leave alongside Bushwhacker and Dirty Guys (a 2-person male team) and they quickly outpace us. 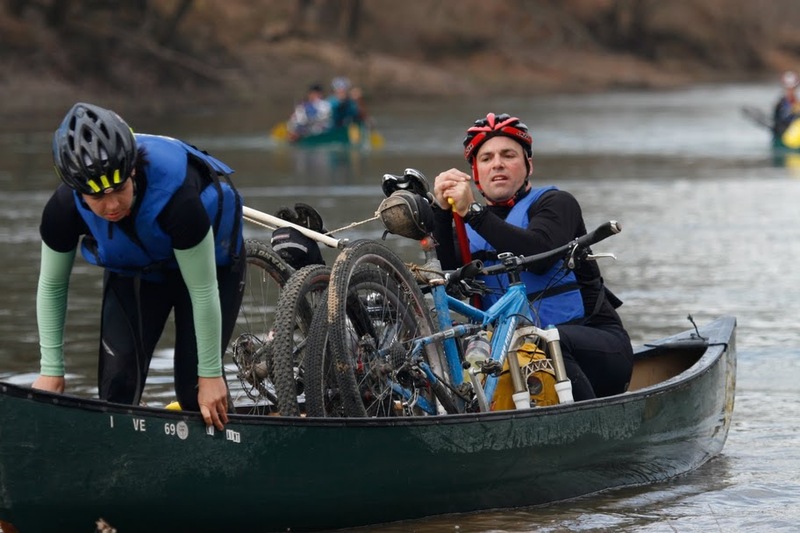 We are sad to see Bushwhacker go but we want to take this bike section a bit easier to let our legs shake out from the stillness of paddling. It’s easy to let Dirty Guys go ahead as their foul mouths are no fun to be around. We keep our own pace and catch Bushwhacker at a stoplight before crossing 109. From there, we stay on the pavement and climb Alt Road the hard way, north to south. I am on tow but Mike is already working hard to deal with the unexpected heat so I try to keep pace under my own power as much as possible. We are able to stay ahead of Bushwhacker as we cruise back into Camp Wyman. As we roll back to the starting line, we are handed another clue sheet (as we suspected) which contains the last 8 CPs of the race, all in one trek. We ditch the bikes, swap shoes, and hustle up to the pavilion to plot away from the other teams who are plotting at picnic tables. After we plot, we take the time to highlight our exact route (choosing 28-26-23-25-24-29/3-27/2-30-F) because it worked well for the opening trek. As my notes indicate, we went CCW. The top two teams went clockwise. 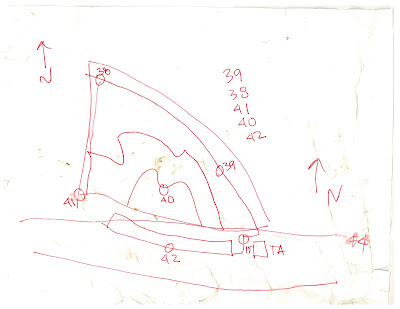 I think the best route might be 30-29/3-27/2-25-24-23-26-28-F.
Maps and compasses in hand, we set off northbound. The first CP takes us a bit of time to find since it was hung higher than I plotted it. This make me nervous for the rest of my plotting results but, similar to the first bike leg, I decide to trust my map and push onwards. We pick up a ridge-top trail and I have to pee AGAIN before we descend to 26. This is a first for me, usually I am a camel when racing. After we punch 24 (in a really cool rocky reentrant), we see Bushwhacker on our tails and hustle up the trail. On this second trek the woods have dried out a bit and the leaf cover is making traction especially difficult. The trail provides a welcome opportunity to jog confidently, well, as confidently as we can until I realize we are on a different spur than I expected. It’s not a huge deal, however, as both seem fairly similar in climb and distance so as long as we keep going forward, we’ll be okay. Mike starts to have trouble with his hamstrings and I assume 100% nav (til this point we had been communicating on just about every route choice). We punch CP29 and CP27 flawlessly as we have visited them in the morning trek. Then we make the last, long climb up to CP30. This one throws us as the flag is hung on the bike trail, in fact it is the same control as CP9, but the clue sheet doesn’t indicate the shared coordinates and we don’t know what to do. Thinking that Bushwhacker is going to charge out of the woods at any minute, we punch 30 and decide to be extra careful descending in case we come across the real CP30. The descent is full of worry and second-guessing as we get closer to the finish line. We see the inflatable arch, hear the Bonk Hard-trademark cowbells and whistles, and cross with much cheering from the 2 other teams there. Wait a sec...two other teams? We’re third? What if we guessed wrong on CP30? Angst!! I ask the finish line volunteers to check our passport before any celebrations get started....and hold my breath. It’s a long few minutes but they announce our course complete and then we can really whoop it up...THIRD PLACE OVERALL! Only behind Alpine Shop and Downhill Bikes Branson, two insanely fast teams! ALSO FIRST PLACE 2-PERSON COED! My heart is so proud of this effort but my actions are immersed in the ritual finish-line route analysis. 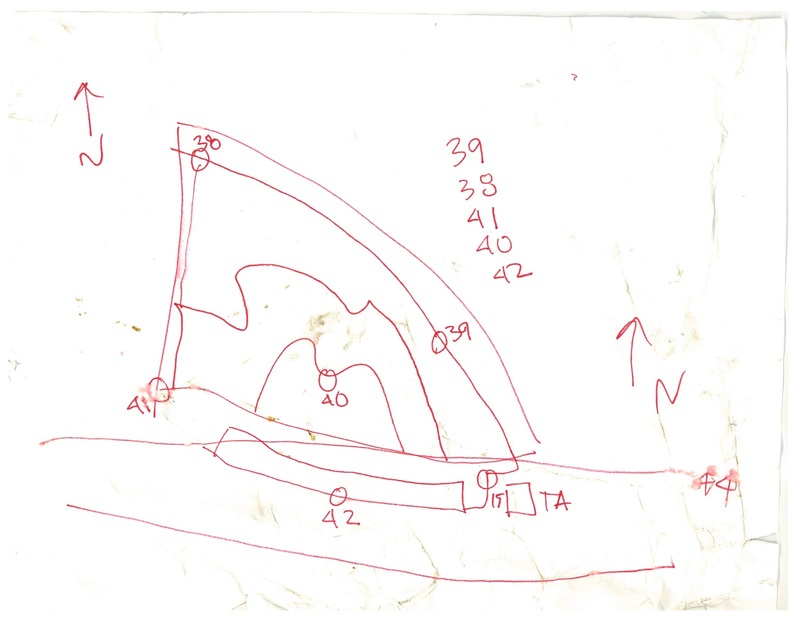 Maps out, fingers pointing and tracing, everyone comparing and contrasting the details of the course. I am in the company of some excellent racers, navigators, and all-around people, succeeding at one of the things I love to do so much. It is a satisfying moment.